Bladderwort has small bladders attached to the leaves which are alternately arranged. Bladderwort are submersed free-floating plants. There are about 200 species in the world, ranging in size from a few inches to several feet long. Tiny bladders attached to the leaves trap and digest very tiny animals. Utricularia species occurs almost always (estimated probability 99%) under natural conditions in wetlands. All bladderworts are rootless. They have main stems from which lacy, often complex leaves grow. Bladderwort flowers are usually bright yellow (but sometimes lavender, depending on species); the flowers have two "lip-like" petals of about equal size. Flowers are on long stalks that emerge several inches above the water. The carnivorous bladders are attached at regular intervals along the linear leaf segments. Common throughout United States. Commonly found in shallow and calm waters. 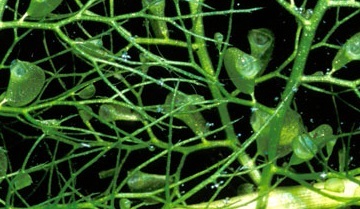 Dibrox® and Spritflo® herbicides are effective solutions for treating Bladderwort. You can order these products on this website. Floating plants like Bladderwort can return after treatment since they are not rooted. Read all product labels for complete instructions before applying products.